Who doesn’t love shortbread cookies? I guess people who don’t like butter might not be shortbread fans, but how many people can that be? These dense, buttery cookies have got to be in my Top 10 list. They originated in Scotland around the 16th century, and were traditionally made with only three ingredients: butter, sugar, and flour. Simply fantastic! Salem Baking Company specializes in vintage cookies. The Winston-Salem, North Carolina company opened in 1930 as Dewey’s Bakery, offering a centuries-old Moravian cookie . They added other products with a “story”, a long history of popularity that spans generations and cultures. Shortbreads certainly fit that category. Making traditional cookies is only part of Salem Baking Company’s equation; their bakers also take care to make their products using traditional methods and natural ingredients. 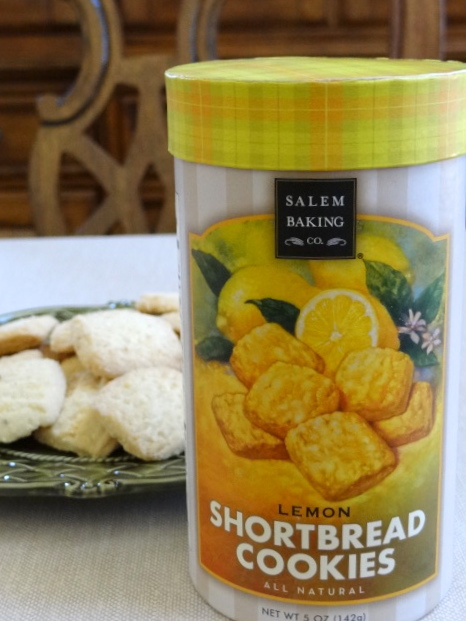 I found Salem Baking Company Lemon Shortbread Cookies at Central Market. The packaging caught my eye, and when I realized this very cool vintage plaid cylinder contained shortbread cookies, the sale was made! At home, my mouth was watering before I could get the package open, and I was very impressed with the taste. The shortbread is very rich and buttery, and has just the right amount of sugar. Lemon oil and lemon peel provide a bright citrus pop that is just awesome! In the past year, I’ve been using pure essential oils in some of my cooking and baking, and I really appreciate the depth of flavor only a few drops provide. The lemon peel adds a delicate crunch to the shortbread and layers the lemon flavor. These shortbread cookies would be great with coffee or tea, and I think they would make a tasty partner to raspberry sorbet. My favorite way to enjoy them so far has been straight from the package! Since Allen doesn’t care for lemony desserts, I will be sharing with a friend, because these rich cookies are just way too tempting! Check out Salem Baking Company’s website and their selection of vintage cookies, flatbreads, cheese biscuits, cheese straws, and their signature Moravian Cookies. I love their vintage gift tins, too!